Galera cluster to AWS Aurora migration & HA_ERR_FOUND_DUPP_KEY | ..::CHANGE is INEVITABLE::.. In this post we will see a case study of a Galera Cluster migration to AWS Aurora and quick solution to the replication issue. We talked about it and I immediately started blabbering cons of writing on both masters, how to handle, roles of apps and so on. He intervened and revealed, it is Galera Cluster replicated to Aurora and he is not writing on Aurora. Okay, so we had replication errors on glr-3 node. The next check we made sure that Aurora instance is not being written. We further looked into binary log to confirm source or server-id that’s being replicated. That revealed the second server-id which gave another pointer: all the nodes of Galera Cluster are being written. Of-Course then, this is bound to happen when mysql finds different server-id than master, it is going to write the changes eventually resulting into duplicate key errors. Asynchronous replication in MySQL depends on server-id to determine the source of the query. This is particularly important to avoid endless loops in master-master or circular replication. Now in this scenario, it was found that all the nodes Galera Cluster had unique server-ids and all were being written. Thus binary log had entries from all the nodes while only one node was participating in master-master replication. Since the changes for server-ids 2 and 3 were already applied by Galera-replication, we are getting duplicate key errors. 1. Write on only one node (and replicate from there). 2. Use same server-ids on all the Galera nodes. 3rd option could have been disabling log-slave-updates but that’s not possible in Aurora cluster (or actually any server which has chained replication further). Also, consider that this is a problem because we’re setting master-master replication; had it been master-slave, we’d have not noticed this. 1. Write on only one galera node and replicate from there. This can be configured on maxscale or any load balancer in order to configure & route the write traffic, though that option was denied. 2. Use same server-ids on all Galera nodes. Galera is certification based replication. On a cluster, before transaction commit, a certification test is performed on each node for determining whether or not the write-set (changes) can be applied to each of the node. If certification fails, write-set is dropped and cluster rollbacks the transaction. This all happens based on a GTID comprises of UUID (dataset-id, cluster-id) and sequence number. where kdar8582-r271-00d2-8582-1jdgnv05e21d is dataset-id while 8518 is sequence number. You can read more about Galera Replication on documentation page. My idea to cover some of the basics here was to show that server-id has no role to play in Galera Replication. We can surely configure same server-id on each Galera Cluster node. 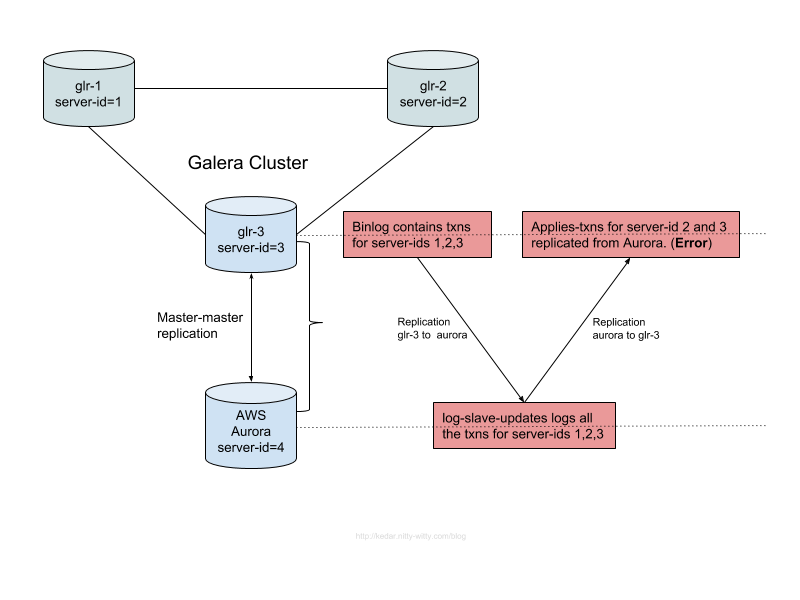 That will nullify the multiple server-ids and hence tackle the duplicate key errors in multi-master replication with Aurora Cluster. My friend went that way to complete the migration successfully. Consider sharing in comments if you have more information on “using same server-id in Galera and its effects”. Hey, nice info ! Keep sharing !